Emory disease ecologist Gonzalo Vazquez-Prokopec explains why the complex properties driving today's disease transmission -- and the speed at which an epidemic can travel -- require new methods of surveillance. Photo by Charlie Watts Photography. Ebola. Chikungunya. Zika. Once rare and exotic pathogens keep popping up and turning into household names. It’s the new reality as the climate warms, humans expand more into wildlife habitats and air travel shrinks the distances across the globe. 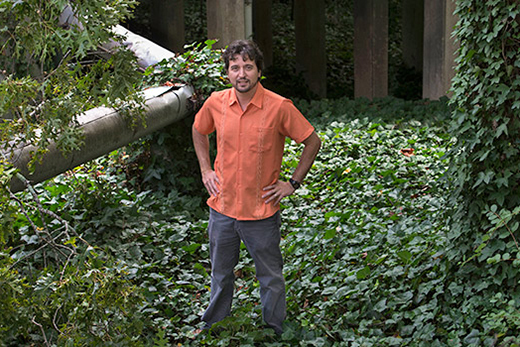 “Africa and other parts of the developing world are undergoing rapid urbanization, so we are going to keep seeing more of these explosive epidemics,” says Gonzalo Vazquez-Prokopec, a disease ecologist focused on mosquito-borne diseases in Emory University’s Department of Environmental Sciences. The complex properties driving today’s disease transmission – and the speed at which an epidemic can travel – call for new methods of surveillance, Vazquez-Prokopec says. He is lead author on an opinion piece proposing a novel way of developing mathematical models of infectious diseases to uncover hidden patterns of transmission, recently published by Trends in Parasitology. For example, he says, disease surveillance tends to focus on people with symptoms, but in cases of many mosquito-borne viruses – such as dengue, chikungunya and Zika – many of the people infected have no symptoms. And these asymptomatic carriers have the potential to infect others. They may even play the role of super spreaders – those who contribute the most to the transmission of the pathogen.